I love the Farmer's Market in downtown Mesa on Friday mornings (9am-Noon, on the east side of Center St just south of University Drive). The produce is great but there are many other vendors with booths to check out. Craft items, bread, tamales, tea, and beauty products were for sale today. 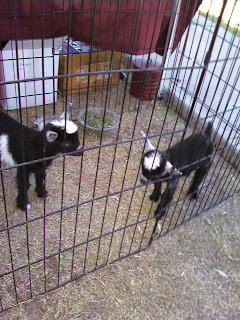 The baby dwarf goats were on site too. . .for petting - not for sale. Aren't they are adorable? Today I picked up organic apples and heirloom tomatoes. The heirloom tomatoes will do double duty - we will enjoy eating them and I will be saving the seeds to start plants for the veggie garden. Three of the sweet, burgundy colored cherry tomatoes yield the same amount of seeds you can purchase for $2.65-$2.99 at the garden center or online. For more info on the Mesa Community Farmer's Market - including maps and photos - check out their webpage at Arizona Farmer's Markets. More photos here.